The other morning, I woke up with an incredible urge for a BLT. We didn’t have any bread, lettuce, tomato or bacon in the house, but I still wanted some bread. Thanks to Pinterest, I found a fantastic recipe for a quick bread that takes about an hour from start to finish. Yes, you read that right. An hour. It mixes up wonderfully fast, rises for 25 minutes, then bakes for about the same time. I couldn’t help myself, and cut off a few slices to try while the bread was still steaming. 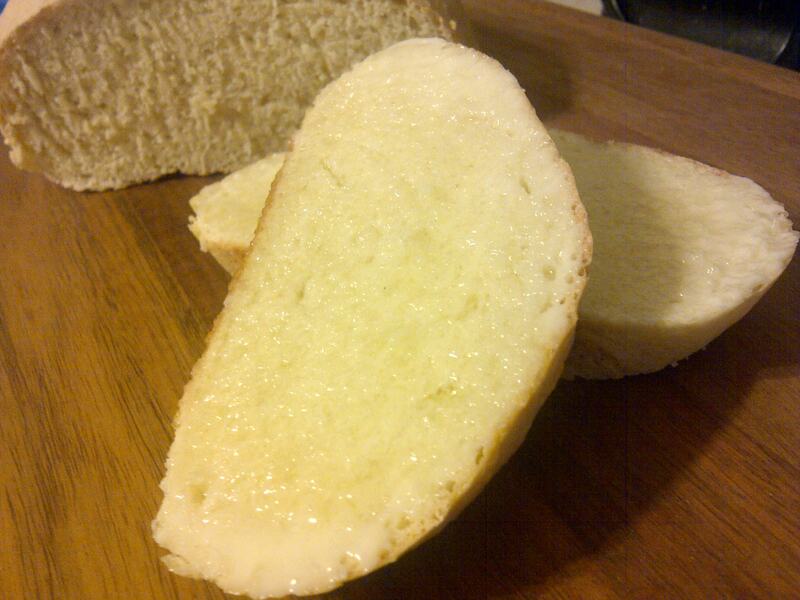 With some butter melting over still-warm bread, oh my goodness, this bread was wonderful. 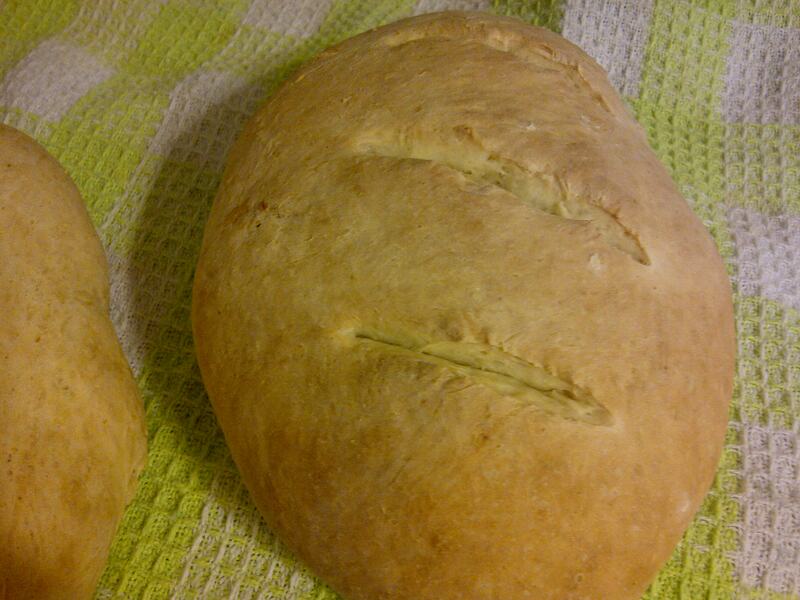 I shaped the loaves by hand, and they rose and baked up beautifully. 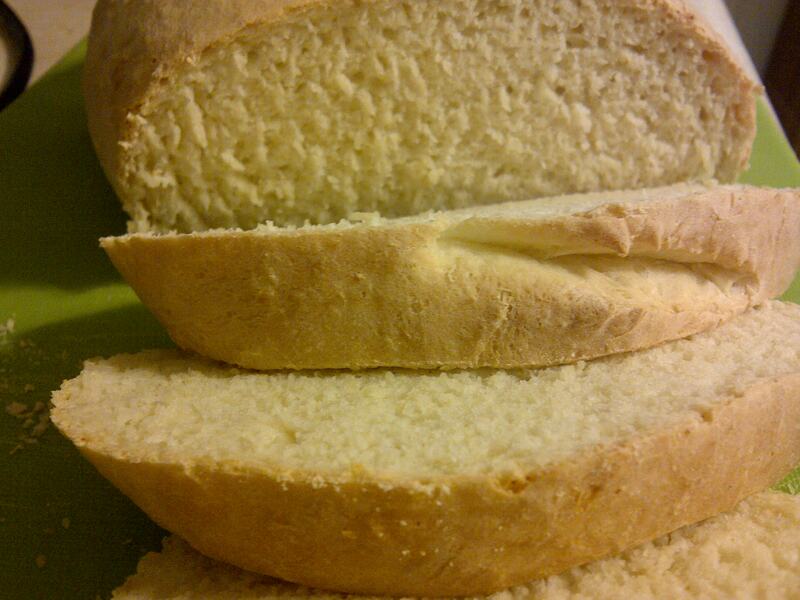 I promise, if you are craving some fresh baked bread and are short on time, this bread is the answer. 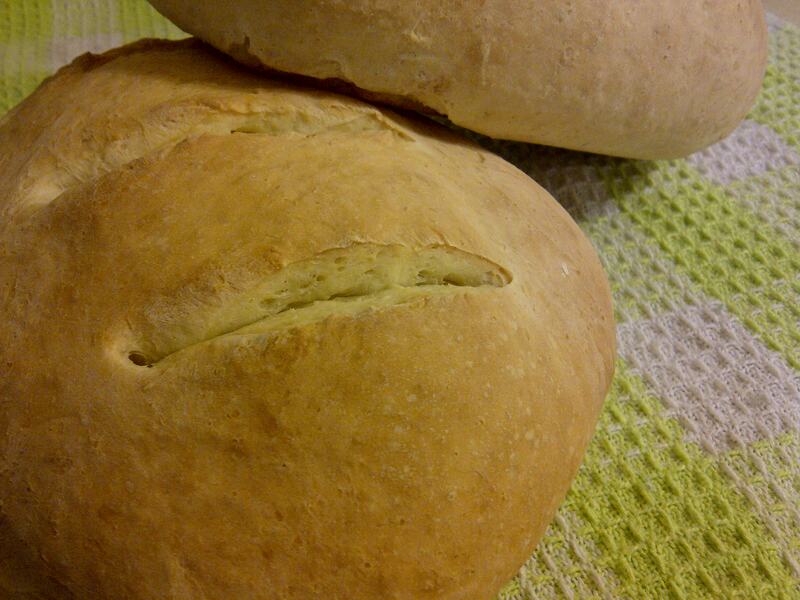 The only change I made was use all-purpose flour instead of bread flour. I don’t bake with bread flour regularly, because I found that I use all-purpose flour so much more than any other kind of flour. Other than that, I followed the recipe exactly and was not disappointed. Now, go make this bread! Fresh, homemade bread in an hour? You can’t go wrong! Mix dry ingredients in mixer bowl. Add oil and water. Mix for 1 minute and then check consistency of the dough. The dough should be very sticky. If it is too dry, add more water. Mix for 5 minutes, and do not add any more flour after the dough has finished mixing. Spray your kneading surface with cooking spray, and turn the dough out onto the surface. Knead dough briefly until it has a smooth and even consistency. This will only take a few turns of the dough – less than a minute of kneading. Divide the dough into two pieces, and shape into loaves. Place on a greased baking sheet (I have silpat sheets that I use) and cover with a clean, dry dish towel and let rise 25 minutes. Preheat oven to 350°F while the bread is rising. When the loaves are finished rising, take a greased knife and cut slashes into the tops of the loaves, each cut about a quarter of an inch deep. Bake loaves for 25 minutes, or until golden brown. Firstly, I am sorry! It has been so long since my last post! Secondly, this is not the first time I have made apple pie this year. 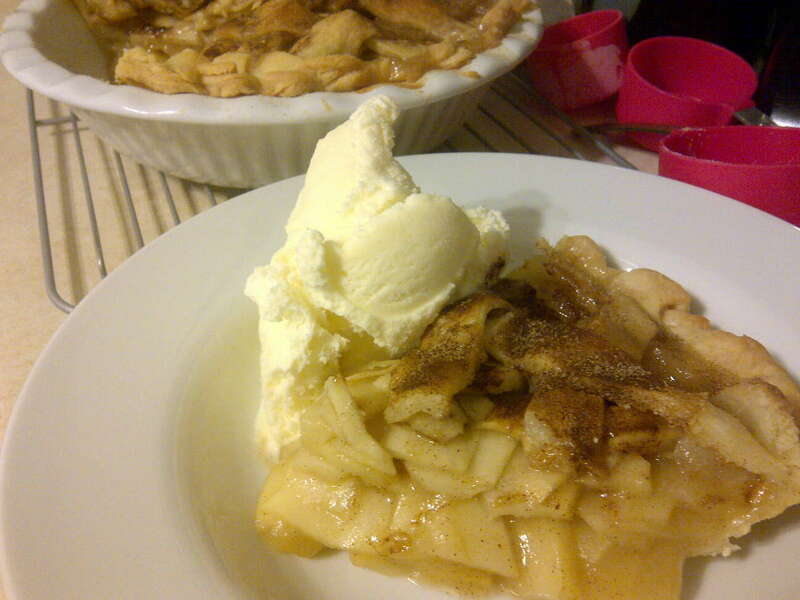 I made apple pie a few weeks ago when one of Paul’s coworkers brought us some apples. However, I was just not happy with the overall look of the pies, and did not want to post them. Trust me, I did it for you. The pies were not pretty. They tasted good, but thumbs down for looks. Today, I went to the store to pick up some things for lunch, and there were some fantastic, huge apples just calling out to me. At first, I was thinking I wanted to make an apple crisp. Then, as I started looking at the apples I bought, it would have been just sad to not bake these apples into a beautiful pie. Now, when I say these apples were huge, I am not joking. 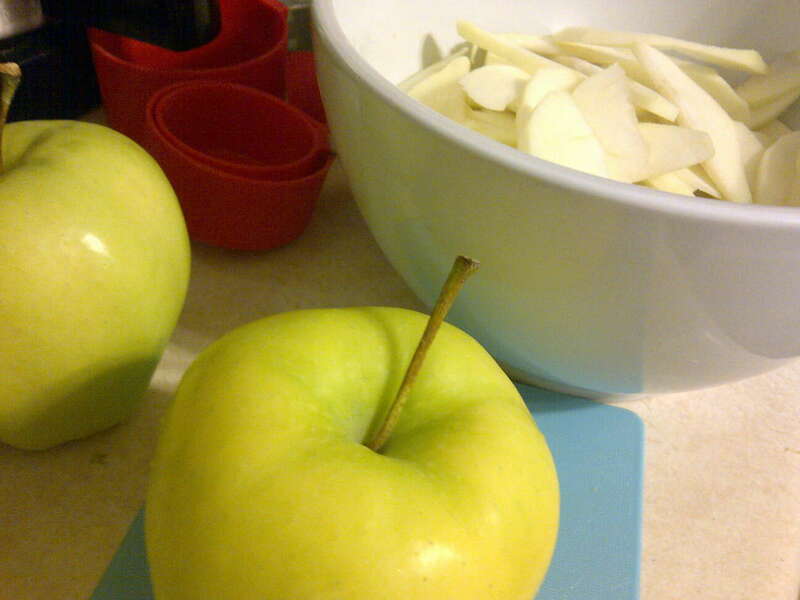 The recipe calls for 8 Granny Smith apples. I bought 7 apples, and could not fit them all into the pie! I had to put a little under half of them into a baggie to save for making a dessert for next week! This pie has never failed me. 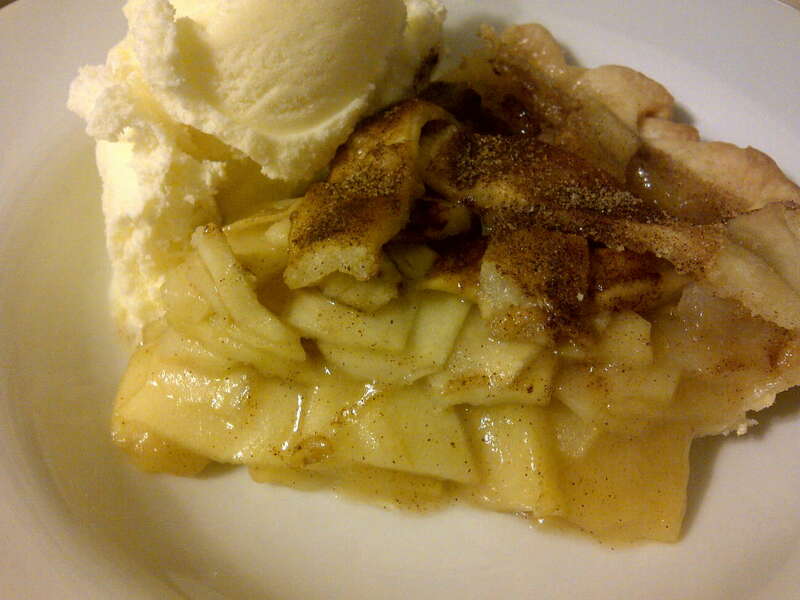 It is absolutely delicious, and served with a scoop of vanilla ice cream, just divine. If you like apples, pie, and just fall in general, this pie is for you. Preheat the oven to 425°F. In a saucepan, melt the butter. Stir in the flour to create a paste. Add the water, sugar, brown sugar, and cinnamon, and bring to a boil. Reduce heat, and let simmer, stirring frequently. Roll out your pie crust to fit the bottom of the pie dish. Pile with apples, mounded slightly. Cover with a lattice work crust. 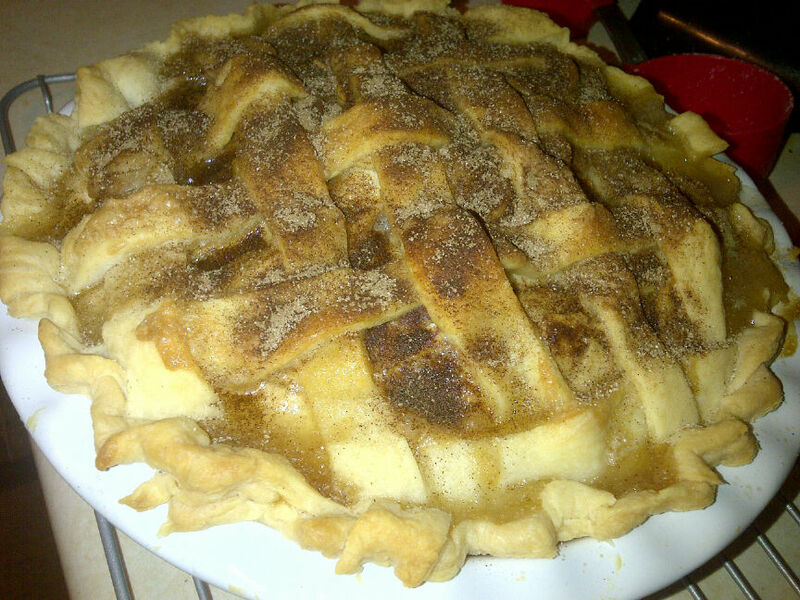 Gently pour the sugar and butter mixture over the crust, pouring slowly, so it soaks into the pie and does not run off. Bake in preheated oven for 15 minutes. Reduce heat to 350°F and cook for 35-45 minutes, until apples are soft. 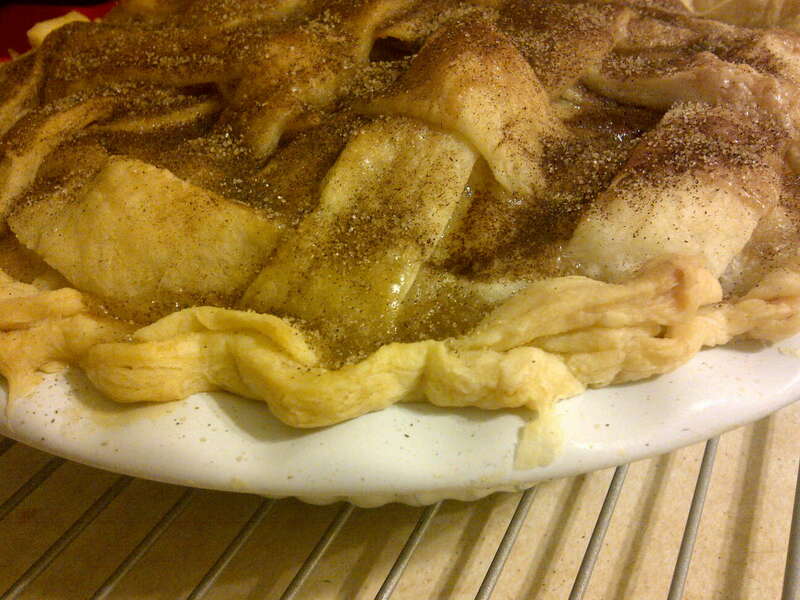 Remove from oven, and sprinkle top of pie with cinnamon sugar. Let cool at least 1 hour, then slice and serve warm with vanilla ice cream.